It’s efficient. Once you get the hang of it, you’re not just operating a text editor, you’re flying a text editor. Watch someone take a large amount of tabular data and turn it into an HTML table with vim. Usually that would take awhile to do by hand in your average text editor. In vim? Thirty-two seconds. If you do use Sublime Text for larger projects, you can enable vintage mode to use the same vim commands in Sublime! Learn vim! No, really, that’s it. Install vim, customize your .vimrc, and try using it for a week or two. Put some effort into learning it, give it a chance, and see how you like it. If you want to ease into it, you can use a graphical version like MacVim so you can still use the mouse or familiar keyboard shortcuts when you’re not feeling particularly adventurous. Be sure to go through vimtutor, which you should be able to launch by running vimtutor at the command line. 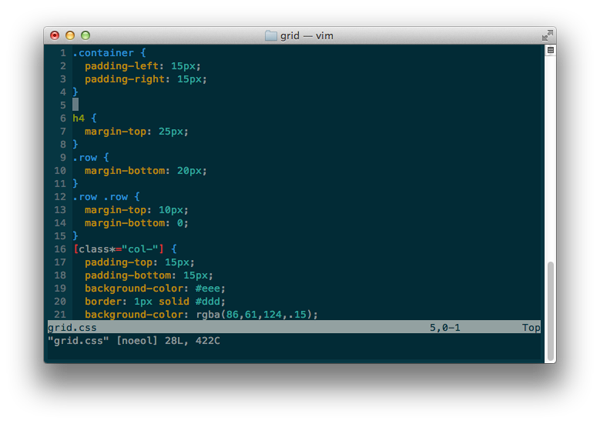 It walks you through the basics of using vim.